Amen. All too often these efforts are intellectual gobbledygook ignored by the public, or derided in the pages of the mainstream media. The Center’s second report is titled, “Who is Professor “Staff,” and how can this person teach so many classes?” Hmm…Let’s guess, shall we? The report was authored by Steve Street, Maria Maisto, Esther Merves and Dr. Gary Rhoades. The information in the report is based on a survey “produced, distributed and analyzed” by the New Faculty Majority Foundation. In the Executive Summary of the report we read a familiar litany of complaints about obstacles facing temporary faculty. They are employed using shoddy hiring practices (often by a department chair pressed for time at the beginning of the term), untrained, lack institutional support and access to requisite materials necessary to prepare their courses. As a result, the report charges, “the educational experience of students suffers, both inside and outside of the classroom.” Or does it? The next sentence of the report reads: “It is only the extraordinary effort, personal resources, and professional dedication of contingent faculty that allows them to overcome the obstacles to quality education that derive directly from their employment status.” So, adjuncts face obstacles that directly and adversely impact the student experience, but adjuncts overcome those obstacles through professional dedication? So what’s the point of a report about obstacles non-tenured faculty manage to overcome through “professional dedication?” The point, of course, is that non-tenured faculty do not manage to overcome the obstacles. There are people hired to teach at U.S. colleges who should not be teaching at all, and this applies to both part-time and full-time tenure-line faculty. One of the principles of Dr. Rhoades’s organization is that outcomes in higher education are too complex to measure and focusing on graduation rates is simplistic. There are community colleges in the United States that graduate just 20 percent of their students. It’s shameful and shocking to push for increased funding, accessibility and affordability within higher education then claim that outlandishly low graduation rates be overlooked. The students who melt into the background without earning degrees don’t deserve to be used as hand puppets in any debate. 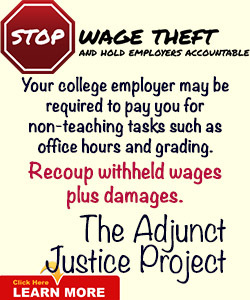 The report focuses on two of the major problems adjuncts face. The first is that many, if not most, of them are hired at the last minute, weeks if not days before the start of a course. That is the reason they are listed as ‘Staff,’ not by their real names, leaving students to guess about who will be running their classes. 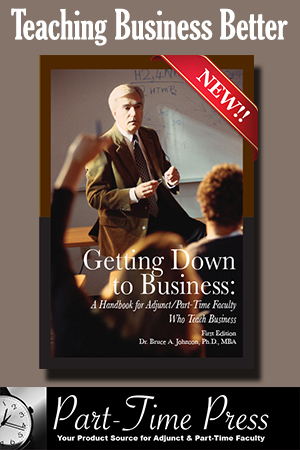 These “just-in-time” hiring practices give instructors very little or no time to prepare for their classes. Thirty-eight percent of the survey’s respondents reported that they had less than two weeks’ notice before the start of class; another 25 percent said that they had between two and three weeks’ notice. And, regardless of the timing of their appointments, they were not paid for whatever preparation they did. The second problem is the limited access to technology and other resources provided to adjunct faculty. Twenty-one percent of the respondents were not given either a desk or office space; another 38 percent received office space less than two weeks before the start of classes. Forty-five percent of the adjuncts gained library privileges less than two weeks before classes began, while 47 percent received copying services less than two weeks before the start of classes. Twenty-one percent of the teachers never received curriculum guidelines; 32 percent of them received guidelines less than two weeks before classes. Access to computers was also limited. The HuffPost writer opens his piece with this naive observation: “The caste system in higher education is alive and well, according to a report recently issued by the Center for the Future of Higher Education.” Anyone who has ever seen the titles Assistant Professor, Associate Professor and Professor, Assistant Dean, Associate Dean and Dean knows there is a caste system in higher education. It’s as close to a monarchy as one can get, actually, with the President serving the role of king or queen. Of course the caste system in higher education is alive and well—non-tenured faculty are at the bottom of the heap. I’m not arguing that’s fair, but I am pointing out that assistant professors are at the bottom of their own professorial heap, as well. The results of the report, while interesting, are somewhat facile. Last minute hiring is why adjuncts don’t have their names listed in course schedules. Who cares? Certainly not the general public. Last minute hiring results in poor hires, who teach by the seats of their pants, inflate grades and short-change both students and their employers. Lack of institutional support means the majority of faculty don’t have opportunities for professional development provided by institutions, and the result is the faculty member who doesn’t know a rubric from a Rubic’s Cube. Most adjuncts weren’t paid for preparing for their courses? Seriously? Let’s turn it around and ask this question: Why are colleges hiring inexperienced faculty to teach courses they’ve never taught before? One of the lowlights was actually quite heartening. Complaining that 21 percent of faculty who responded to the survey “were not given either a desk or office space” means that 79 percent of temporary faculty who responded were provided with a desk or office space. While college administrators certainly deserve to be taken to task for a wide variety of lazy hiring, Grinch-like pay policies, and sloppy training practices, it seems fair to give credit where it’s appropriate to do so. 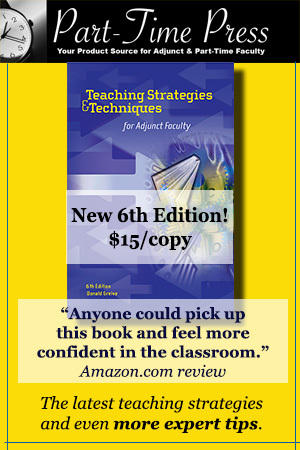 An adjunct with an office, is an adjunct who has a place to keep teaching materials, grade, and meet with students. I also have to believe that while 45 percent of adjuncts who responded had library privileges, very few institutions would deny a faculty member the opportunity to take out materials, put materials on hold for students, schedule a tour of the library for students, use the facility for class assignments, or use a library computer to read journals to which the institutions subscribe electronically. There are also many non-tenured faculty who don’t make use of the college’s library at all while teaching courses, and those for whom limited access is not an issue at all. The report quantifies long-standing issues surrounding the reliance on huge numbers of non-tenured faculty. 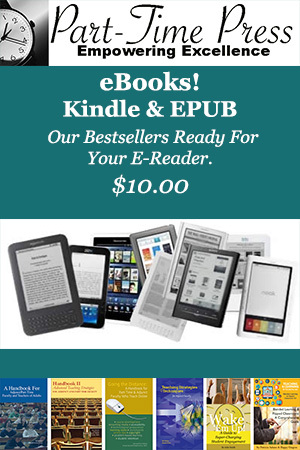 It focuses on issues that are somewhat arcane (being listed by name in the course catalog), and others that set up the authors of the report as out-of-touch whiners (no pay for preparing to do the job for which one was hired as a temporary employee). The report concludes by suggesting academic institutions get a clue about the working conditions of their adjunct faculty. The authors suggest the New Faculty Majority Institute’s survey be used by colleges to assess the State of their Adjunct Nations. Alas, academic institutions know very well the working conditions of their adjunct faculty. It’s not that the information needs to be sussed out. It’s that leaders of two- and four-year colleges throughout the U.S. are offered few compelling reasons to change the rules of the game invented by industry and perfected by academics. When you’re right, you’re right. I’ve updated the piece, and apologize to both Dr. Rhoades for the error. Rhoades is a professor of higher ed at U of Arizona, not a CC president. If you are going to attack a pro-adjunct report at least do your research before engaging in character assassination.